One of my favorite things about summer, besides being able to wear shorts, is enjoying the bounty of fresh fruit. Inspiration for desserts is never a problem in summer: I just have to go to the farmers’ market and I’m bedazzled by the overflowing baskets of blueberries, peaches, nectarines, cherries, and strawberries before my eyes, beseeching me to find them a home in a delicious dessert or two. There’s no end to the possibilities of what you can make with a ripe bowl of fruit; in fact, sometimes the challenge is deciding what recipe to try before you’ve eaten all the fruit out of hand! Since summer can also bring hot, lazy weather that discourages long hours in front of the oven, I like to have several dessert recipes on hand that are quick, simple, and allow the simple beauty of summer fruit to shine through. Here they are: feel free to use whatever fruit catches your fancy, as they’re all quite easygoing and adaptable recipes! Fruit mixed with yogurt isn’t just for breakfast; frozen into popsicles, they are a delightfully refreshing treat. It’s also fast- you don’t need to create an ice cream base, just use your favorite yogurt. Be sure it’s not nonfat or lowfat, though – your popsicles will be icy instead of creamy. If you can find Greek yogurt, its indulgent richness and tart flavor is a lovely counterpoint to sweet, fresh, fruit. I chose a classic trio of berries – blueberries, raspberries, and blackberries, and pureed them into a smooth coulis to swirl into the yogurt. If you don’t have popsicle molds, I’ve discovered a trick that I love: Dixie cups. 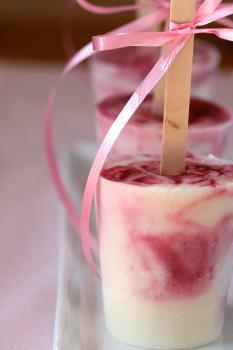 They are the perfect size and shape for popsicles; just pour in the yogurt, insert popsicle sticks, and freeze. Once the yogurt is frozen, you can simply peel off the paper cup to reveal a popsicle ready for licking! Be sure to check the popsicles about half an hour after you’ve placed them in the freezer: oftentimes the sticks will shift and you can make sure to adjust them so they’re straight. 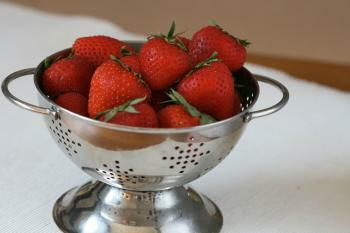 To make the berry coulis: Wash berries and process in a food processor until liquid. Strain out the seeds. Add sugar to taste – start with 2 tablespoons and depending on the tartness of the berries and how sweet you want it, add more. Add in the lemon juice and stir to combine. For the yogurt base: Pour out the yogurt into a large bowl. Add in the sugar to taste, depending on how tart you like your yogurt. Add in the berry coulis and carefully swirl in with a rubber spatula. If you want it fully combined, you can keep folding in the coulis until the yogurt is a uniform color, otherwise you can leave it swirled. 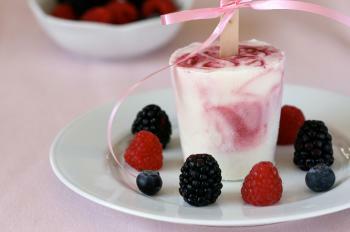 Divide into prepared popsicle molds or into Dixie paper cups. Place in freezer overnight until set. Sometimes, when the fruit is so amazingly fresh that you don’t want to do anything else but pop it straight into your mouth, it’s nice to keep things simple so you can showcase the beauty of the fruit. One of my favorite ways to present gorgeous, right-off-the-vine fruit is peeled, cut, and tossed in a bowl with a little sugar syrup glaze – fruit salad with dressing, if you will. Recently in a pastry class, we infused the sugar syrup with lime zest and mint leaves – it was a revelation. Absolutely dynamite on tropical fruits like pineapple and coconut, the mint and lime add a sparkling grace note to the fruit, and prevent the syrup from becoming too cloyingly sweet. If you add in a dash of rum, you could even get a little mojito flavor! The sugar syrup is a snap to make ahead of time, and once it’s cooled, you can store it in the refrigerator almost indefinitely. Then, when you’ve brought home some fruit and it’s too hot out to do any cooking, you’ve got all the ingredients on hand for a breezy little dessert! Since strawberries are still at their peak now, I combined them with some mangoes for beautiful color contrast; their sweetness also nicely contrasts with the tart syrup drizzled on top. To make the lime-mint syrup: Combine the sugar, water and zests in a medium saucepan. Heat over medium-high heat until all the sugar is dissolved and mixture has come to a boil. Remove from heat and add in mint leaves and lemon juice, and cover. Let steep for about 30 minutes. 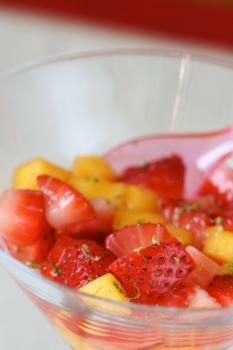 To assemble the salad: Combine the strawberries and mangoes in a bowl. Pour the lime syrup over the mixture, toss lightly, and portion into individual dishes to serve. Fruit pies, cobblers, tarts…all summer classics. Although the perfect flaky pie crust is a perennial challenge, when I feel like something simpler a crisp is the way to go: buttery streusel sprinkled over fruit, baking into a crispy-gooey-spicy-sweet cup of delight. The key to making streusel is to cut in cold butter just enough so that the mixture looks like loose gravel or peas; you don’t want to overmix it into a homogenous lump or it won’t have that wonderful crumbly texture. You can also add spices or nuts of your choice into the streusel mixture. Since I had peaches and rhubarb, I added in some ginger to bring out the fruit flavors. You can also try nutmeg or allspice for a cozier version, or chopped pecans or walnuts. Almost any fruit will work for crisps – I like using a couple different ones with flavors that will play off each other. 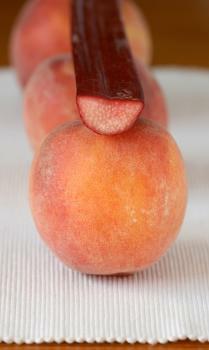 Here, the sweet, ripe peaches seem even more nectar-like paired with tart, crisp rhubarb. Although this crisp can be made in a single pan, I like to make individual crisps in ramekins – there’s something magical about having all those little dishes lined up, filled with fruit, ready to be popped in the oven. Holding a warm fruit crisp in your hand is like having a bowlful of summer, ready to be savored. 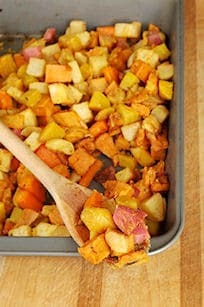 Preheat oven to 375 degrees F. Butter an 8 inch baking dish or individual dishes. 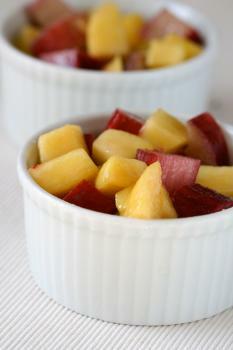 Combine peaches, rhubarb, ¼ cup sugar and ¼ cup flour in a bowl. 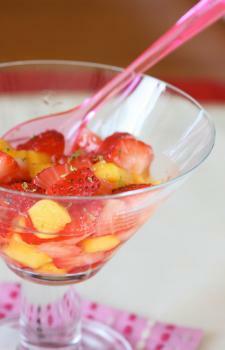 Spread fruit mixture evenly across bottom of the dish/dishes. Combine ¼ cup sugar, ½ cup flour, brown sugar, cinnamon, ginger, and salt in a food processor until finely ground and combined. Add butter and process just until the mixture starts to come together into lumps. Sprinkle topping mixture over the fruit. Bake for about 35 to 40 minutes, until the fruit is bubbling and the topping has turned golden brown.